In Figure 5-1, four different types of data links were used to deliver the data. When the network layer protocol is processing the packet, it decides to send the packet out the appropriate network interface. Before the actual bits can be placed onto that physical interface, the network layer must hand off the packet to the data link layer protocols, which, in turn, ask the physical layer to actually send the data. And as was described in Chapter 3, "Fundamentals of Ethernet LANs," the data link layer adds the appropriate header and trailer to the packet, creating a frame, before sending the frames over each physical network. The routing process forwards the packet, and only the packet, from end-to-end through the network, discarding data link headers and trailers along the way. The network layer processes deliver the packet end-to-end, using successive data-link headers and trailers just to get the packet to the next router or host in the path. Each successive data link layer just gets the packet from one device to the next. Figure 5-2 shows the same diagram as Figure 51 but includes the concepts behind encapsulation. Because the routers build new data-link headers and trailers (trailers not shown in figure),and because the new headers contain data-link addresses, the PCs and routers must have some way to decide what data-link addresses to use. 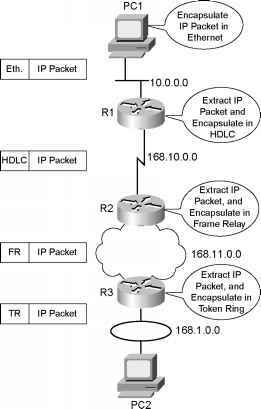 An example of how the router determines which data-link address to use is the IP Address Resolution Protocol (ARP). ARP is used to dynamically learn the data-link address of an IP host connected to a LAN. You will read more about ARP later in this chapter. 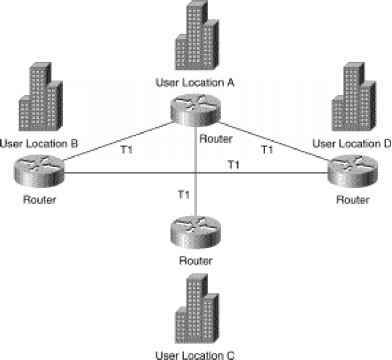 In short, the process of routing forwards Layer 3 packets, also called Layer 3 protocol data units (L3 PDUs), based on the destination Layer 3 address in the packet. The process uses the data link layer to encapsulate the Layer 3 packets into Layer 2 frames for transmission across each successive data link.